Gender Recognition Act - Have Your Say! Arts SU is responding on your behalf to the Government’s consultation on the Gender Recognition Act. Lead by Katayoun Jalilipour, your Arts SU Welfare Officer, and alongside UAL, we have been supporting Stonewall’s campaign for new rights for trans (including non-binary) and intersex people. To see our response and to show your support for the Arts SU consultation response, you can sign our petition here! 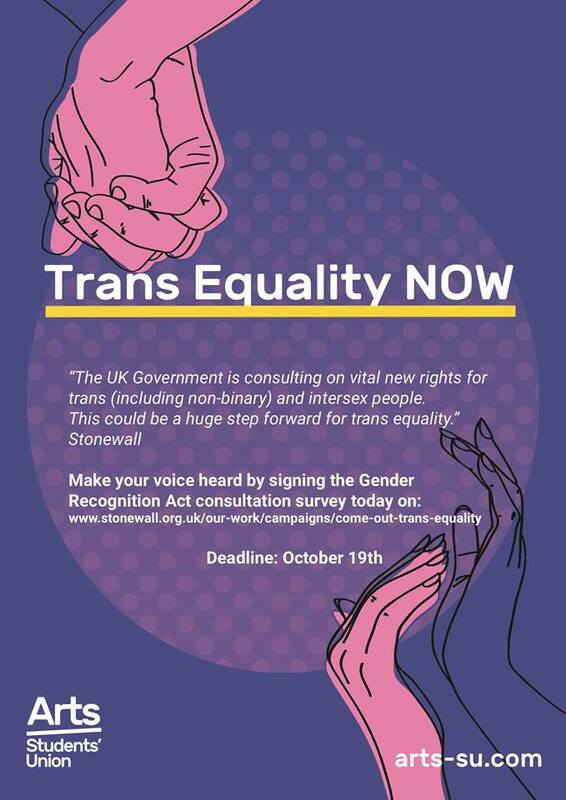 We are also encouraging anyone with the time or who would like to respond as an individual to do so through the Stonewall website, by following this link: http://www.stonewall.org.uk/our-work/campaigns/come-out-trans-equality. The consultation closes on 19 October 2018 so sign our petition by 18 October 2018 to be included.